T-55A is a member of large family of Soviet post-war tanks – the first link in the chain was T-44 and the latest – T-62. All shared the hull’s layout and engine but differed in the shape of the turret and main armament. T-44 entered series production in late 1944 and was in fact a combination of T-34/85 turret with new hull and running gear with the wide tracks, long torsion bars and the transverse installed V-44 engine (a derivative of V-34 powering T-34). T-54 (produced since 1946) retained the T-44’s hull almost unchanged but had the new turret designed to accommodate the D-10T 100 mm gun. Later the turret’s shape was modified and finally became a smooth hemisphere. T-54A (in series production since 1955) received a simple STP-1 gun stabilizer, T-54B (1956) – two plane STP-2 Ciklon stabilizer and the IR active night sights TPN-1 and TKN-1 with L-2 searchlight. Then the T-54M followed – it had the protection set against nuclear weapons, improved V-55 engine, new lateral gearboxes, air compressor, additional oil filters, enlarged internal fuel tanks and the ammunition storage increased to 43 shells while the AA machine gun of DShK-12,7 type was removed. 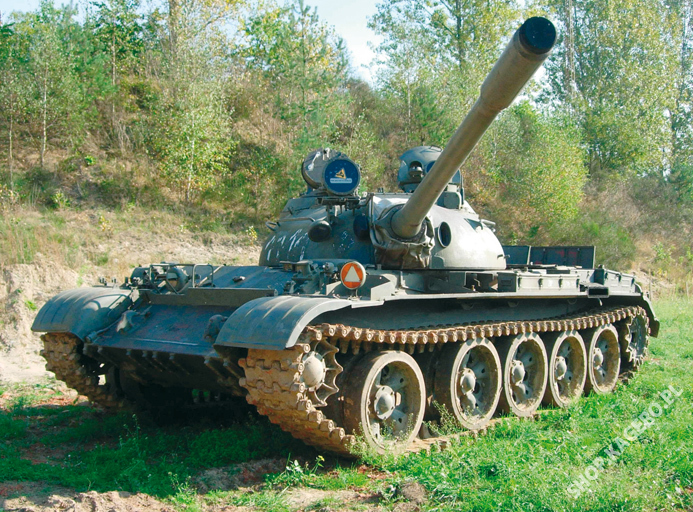 The tank went into series production as T-55 (Object-155) simultaneously in Kharkiv, Nizhny Tagil and Omsk. Differences between T-54 and T-55 were less evident than between T-34/76 and T-34/85 – the new designation was just an attempt to fool western analysts and to gain propaganda effect. The mass production of T-55 started in 1958 and was continued in Soviet Union (in improved configurations) till 1979. The T-55A (Object-155A) was designed in 1961 by the 183 Plant DB (Kartsev team) with a main goal to improve the protection of the crew – the new synthetic material was introduced as the internal layer to absorb gamma rays. The secondary function of it was protection the crew against splinters in the case of puncturing of armour by enemy shells. An external sign of increased protection was the smooth commander’s cupola base. The hull mounted machine gun was removed. Such a version was introduced into service in 1962. Three years later new tracks with rubberized bolts were implemented and R-123 radios replaced older R-113s. Since 1969 the AA machine gun was re-introduced as the helicopter threat emerged (the re-introduction of T-54 style gunner’s hatch was also necessary). In the 1974 the decision was made to add the externally mounted laser range finder KDT-1 to the gunsight. Such MBTs retained the T-55A designation and only after the major refit conducted in early 80ties the T‑55AMs emerged. The precise number of MBTs of that type produced in Soviet Union was never disclosed, in Poland some 5000 of all T-55 variants were built since 1964 and in CSSR – 3820 T-55A between 1967 and 1982. 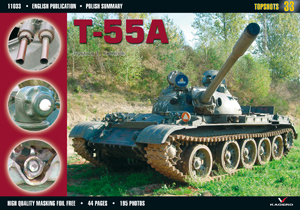 T-55As were a subject of export (for some customers without absorbing layer) since early sixties of 20th century and later often re-sold to third parties so the exact number of operators is not easy to determine. T-55A was chosen as a base for some local versions and support vehicles in some countries. In Czechoslovakia the T-55AM Kladivo was developed (roughly a counterpart of Soviet T-55AM with Volna sighting complex), while in Poland the T‑55AM Merida entered service. The armoured recovery vehicles: VT-55A (in CSSR – 1820 produced) and WZT-2 (in Poland – over 600 built) used modified T-55A hulls and running gear. Assault bridge layers MT-55A and BLG-67 based on T-55A hulls too. Despite widespread opinions T-55 was never produced in China – the T-59/69/79 family based on early T-54s.